A brief interview with owner Jack Sachs. 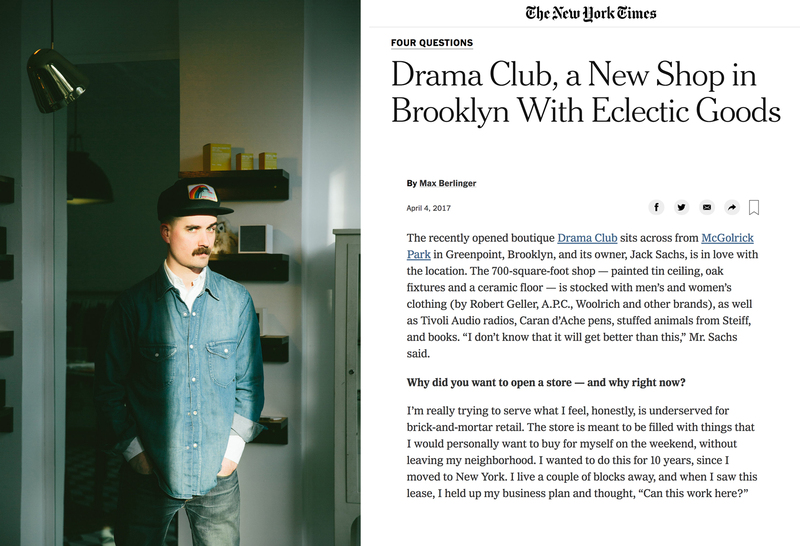 The recently opened boutique Drama Club sits across from McGolrick Park in Greenpoint, Brooklyn, and its owner, Jack Sachs, is in love with the location. The 700-square-foot shop — painted tin ceiling, oak fixtures and a ceramic floor — is stocked with men’s and women’s clothing (by Robert Geller, A.P.C., Woolrich and other brands), as well as Tivoli Audio radios, Caran d’Ache pens, stuffed animals from Steiff, and books. “I don’t know that it will get better than this,” Mr. Sachs said. Why did you want to open a store — and why right now? What is it that you love about having a store? I love the simplicity of it. When I open that door, my goal is to sell the stuff in the store. When I go to an appointment, my goal is to pick things that will sell. And that is sort of divine to me, because I don’t have to worry if I’m doing the right thing or the wrong thing, so long as it’s effective. I am happy to check my ego, to learn from my customers, to get them what they want. I still get to edit it, it’s still my store, but it’s their store, too. What was your goal with this first assortment? I just wanted to make sure I found a group of things that I couldn’t live without. For me, it was about a collection of items that can build a wardrobe. Why did you name it Drama Club? I moved to New York as an actor, and that has not been the through line of my New York experience — retail has. I realized the part of me that loves to be on stage and the part of me that loves to tell a story is the same part of me that likes to curate what I buy for the store and to talk to a customer. The storytelling of retail is part of that daily reality.